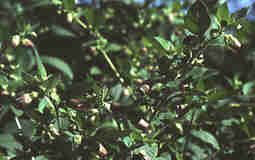 Deadly nightshade – the whole plant contains muscle relaxing substances. It is therefore highly poisonous. The plant belladonna or deadly nightshade, Atropa belladonna, got its name from an old Italian custom of dropping the juice of the bush’s berries into the eyes. This was mainly used as a beauty product. When the juice came into contact with the eye, it relaxed the circular muscle which controls the size of the pupil and the pupil could not contract. The women who used it therefore got big dark eyes which were considered beautiful, thus giving rise to the Italian name belladonna. Atropin is a very powerful poison that has been refined from the plant. It is a muscle relaxant and is used for antispasmodic drugs e.g. during operations. It affects the muscles by inhibiting a certain part of the nervous system. That is why, apart from cramp relief, it has side effects that relax the circular muscle of the eye, reduce the production of saliva and make urination difficult. Atropin is used in the army as an antidote to nerve gas. This is because some nerve gases affect the nerves in exactly the opposite way and so one kind of poison cancels out the other.